This is the sauce made from a kind of anchovy marinated with salt and fermented over the year in container. The fish meat and the salt made the flavor: fishy and salty and in the end the mixture will be filtered and blended. Fish Sauce is the basic ingredient in Thai cooking, like the Soya Sauce is needed in Chinese or Japanese cooking. Like Soya Sauce, Fish Sauce also has grades. The premium quality fish sauce will be bottle is the more sophisticated bottle and the lower grade will be bottle in the old fashioned bottle or in gallons for the big quantity. I found several brands of Thai Fish Sauce in Asian Groceries in Europe. 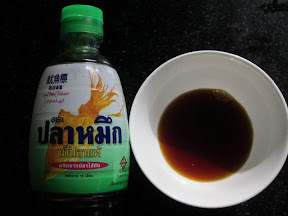 The Vietnamese Fish Sauce tastes similar to the Thai Fish Sauce. In Fish Sauce I think the brand doesn’t make the taste that much different than the grades of the fish sauce itself.